We had 50 players yesterday. Dazai won the tournament with Ravager Shops--congrats! This week we saw a fracturing of shops deck into Eldrazi-heavy lists like Thiim's winning decklist from last week, and more traditional ravager shops decks. In addition, many of the mentor decks which did well included a Tinker/BSC plan, likely to combat the ever increasing thorn presence online. Note that some of the tags have been shifted around. To cut down on manual entry I (with some html parsing help from Vasu) created a python program to pull down the results from WOTC's website and tag lists. It wasn't clear to me how to write an aglorithm to tag decks as "blue control" or "big blue", so I went with tags that are more straightforward to identify. Thanks to Matt for helping collect the results! Thanks for the write-up. I got my first top 8 with a terrible Mentor/Depths brew that I just chose for laughs, but got lucky with over and over again. At least it makes up for bad luck on many other occasions. I'm curious if Oath can sustain its respectable 57% win rate in the Challenge and a 4-0 and 3-1 in the later daily. Wow: Shops were 1st, 2nd, 3rd, 6th, and 7th. Still nearly 40% of the field but now consistently dominating the top 8 field at well over 50%. This is the most dominant Shops has ever been. It wasn't this strong in the Trinisphere or Lodestone eras. Obviously, Shops performance is driven by printings, but I'm beginning to wonder if paper just suppresses Shops largely because of the availability of Workshop. @smmenen Certainly a possibility. From a format health/player happiness perspective, do you view the cost of Workshop as a point for or against restricting it, assuming the DCI is looking to weaken the archetype? @smmenen You're not wrong, but I think there are other factors--e.g. "I love my blue cards"--which matter in the sense of it shifts 3-4 players away from Shops, at least in the northeast. It's also--while more winning in aggregate--a lot more linear of a deck. There are clear expression of skill, but they are different than blue expressions of skill, and that puts many people off. Props to thelastgnu for making top 16 with Gifts. I only made 3-3 myself, but it's good to see Gifts continue to have one of the best win percentages online. I predict If Shops continues to take over the metagame, Gifts will start to be more and more appealing to other players and will eventually take the meta back from Shops, sending Jazza back to the drawing board. 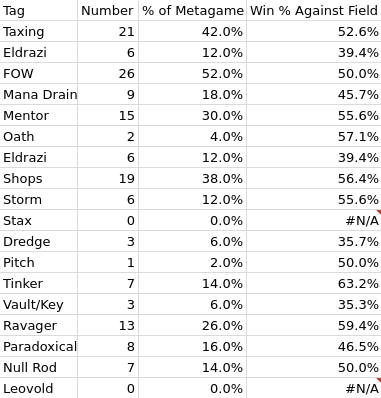 I'd like to see the numbers of Regular Shops vs Eldrazi Shops - which deck is doing better in the overall metagame? I'm kinda surprised the regular variant did that well, considering the upswing in Null Rods. @wintage That information is available from the spreadsheet (link in the original post). You can download your own copy and use the Search tab to look at a player's results or the archetype breakdown. We also encourage people to double check our work. Don't ask me what 1-5 Cat Inspector Shops is - @diophan watched the replays. The breakdown for Eldrazi Shops is 17 wins and 19 losses, for a 47.2% MWP. The breakdown for Non-Cat Ravager Shops is 48 wins and 32 losses, for 60% MWP. This includes mirrors and matches within the archetype (which are not included in the above breakdown). Note, Ryan used a parser that counted Reality Smasher as the Eldrazi tag, which didn't include Akash's or Rich's decks. I fixed them in the spreadsheet and the Eldrazi tag goes to 8 decks at 40% MWP. Does anyone have the link to the spreadsheet for the Vintage Challenge 7/29/17? I see spreadsheet links in this post and the prior one, but not back in July 29th. Thanks. @chubbyrain Cat Inspector is Inspector Shops with Slash Panther (clearly). When I get home tonight I plan to take an aggregate of the win rates from the past three challenges and calculate theoretical metagame percentages from a larger sample size than I used last time. I have an intuition not enouph people are playing gifts or big blue, but I want to run some real numbers around that. Sorry one more question. What exactly is the difference between big blue and blue control? Are they both mana drain decks? And would I be missing something important if I combined them to get a larger sample size? Thanks. The top 32 looking a little more diverse. Down to 85% from 90% and 88% Misstep or Thorn thanks to a few intrepid souls running 2 or just stacking Defense Grids up. @walking-dude Both decks are part of the old Mana Drain pillar. Blue Control refers to decks like Landstill, UW Stoneblade, Blue Moon, which are trying to play a more fair game. Big Blue refers to decks like Grixis Thieves, Tezzerator, Academy Combo, or Gifts that are generally trying to do something broken with Tinker or Yawgmoth's Will. Both of these are non-Paradoxical decks. @smmenen Well, people can definitely play what they want more often on MTGO than anywhere else (besides 100% proxy and cockatrice, but for sanctioned, competitive play it's MTGO). The other thing is that card availability on MTGO is instantaneous. Let's say I play one of my terrible brews and get frustrated with the results. Then I see how Thiim's awesome MUDrazi deck has been crushing people. So I add my entire deck to my trade binder, get a few hundred tickets, and buy Thiim's deck card for card. That process is as quick as five minutes (if you want to scout the best deal it could take longer). Alright I'm at lunch typing this up from memory since I'm not at a computer, I'll probably follow up with exact numbers later. This time instead of a simple goal seek I used as evolutionary approach. I calculated win percentages by aggregating the matches from the last 3 vintage challenges and then recalculated win percentages as if all 3 were a single large event. I excluded decks that didn't get 6 instances across three events, so that meant no delver eldrazi or non outcome combo. I left big blue and blue control as separate decks rather than combining them into a drain pillar (may do that tonight). I started with each deck shops, dredge, outcome, oath, mentor, big blue, blue control, and other having equal share of the meta. 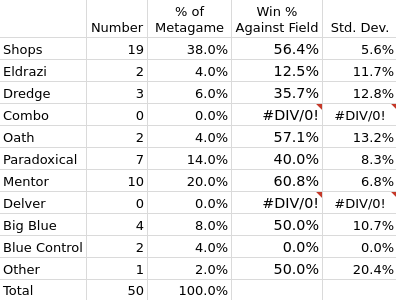 Then based on the win percentages and meta share I calculated each deck's win percentage against the field. For each deck with a below 50% win percentage, I assumed 10% of the people playing that deck would move to a deck that had a >50% chance against the field with the shares being proportional to how much the new deck was beating the field. I then repeated this 2000 times to see if a stable meta emerged with a balance of decks that all won about 50% against the final field. That's didn't happen, instead the meta settled into an oscillating patter that repeated every 150 iterations or so. In this repeating pattern oath and outcome are unplayed. They get forced out of the meta pretty quickly (less than 50 iterations) and never come back. The two main pillars are shops and big blue. Shops goes from about 20% to about 57% and back. Big blue goes from around 25% to around 60% and back. These two decks together are never less than 70% of the meta and sometimes make up as much as 80%. The mix of the remaining 20%-25% drives where the main two decks are in the cycle and which of them are waxing or waning. Of these, other goes from 0% to 5%, blue control goes from around 5% to 15%, and mentor also is in the 5% to 15% range. Obviously all this analysis depends on the win percentages being accurate, and we don't actually have the sample size to derive accurate percentage information. So don't take this too seriously. But it gives an interesting picture of how things play out if what we are seeing is actually accurate. Also more people need to be playing mana drain. Sleeving is faster on MTGO also. Awesome job as usual @ChubbyRain and @diophan. This makes the case for paying attention to MTGO results as a barometer of the health of Vintage stronger, not weaker. Less stickiness in deck selection implies a "truer" representation of metagame composition and health of the format. The fact that Shops are so expensive on paper suggests that their actual metagame representation is artificially suppressed, especially in paper environments, relative to non-Shops strategies. That MTGO has greater substitutability generally makes it all the more remarkable that Shops are dominating.